It was now the end of April. Our manuscript was finally in the hands of an editor, but the cost of achieving that milestone had been high… and painful. The relationship with our publisher was taking strain as we attempted to bridge the gaps in our different modes of business operation, we had lost 6 weeks and slipped our publishing date from Valentine’s Day to May, and after spending months trying to write to an invisible target, I was totally frazzled and completely burned out. So, when the subject of Judy’s upcoming early-July birthday arose, there was really no question about needing time away. When I asked where she wanted to go, Judy said, “Well, how about Napa?” In turn I said, “How about Paris!” It seemed like the right thing to do—romantic, restful, great food and just the two of just in the City of Lights. It meant that we would be in Paris for the anniversary of our second “first” date, as well as the anniversary of beginning to write our book. Paris it was! On the last day of June, we boarded a 7am San Francisco flight to Paris. It felt great to just collapse into an airplane seat and snuggle up to Judy—no writing, no deadlines, no interruptions. It was like the entire pressure of our project was breathed out in a single moment. Ah, this is what it’s like to feel free again. We nibbled on snacks (and each other), watched movies on the iPad, and talked about what we hoped it would be like in Paris at night under the stars. Without a direct flight, we had to stop at JFK. I know many people who are annoyed with having to stop, but Judy and I actually prefer to break up a long flight. I’m 6 feet, with fairly long legs. Judy is 5’ 9 and a half inches, with extremely long legs. For us, an airline seat might just as well be a medieval torture device that crushes knees and folds shins. Dividing a flight into two shorter segments works very well for our cramped extremities. 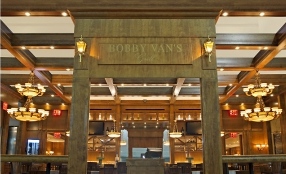 Besides, on a previous trip we had discovered JFK’s Bobby Van’s Steakhouse–our mid-trip destination. A faithful replication of the famous NY City Steakhouse, the JFK version offers true civility in an airport realm completely bereft of anything except MacDonald’s, frozen yogurt, and the ubiquitous convenience mart. With two hours before the Paris flight, we settled into Bobby Van’s menu oh so easily: an excellent bottle of Napa Cabernet, succulent fried calamari, perfectly-cooked crisp green beans that snapped in our mouths, a delectable juicy burger for me, and a superbly seared medium-rare ribeye steak for Judy. Yes, this was the way to travel! With our legs stretched, tummies filled, and bill happily paid, we boarded the final leg to Paris…. Click here for Episode 28: The Only German Restaurant in Paris? !